And here Sam explains the story behind Dogfish Head Indian Brown, which, as I've said, is one of my favorites. This beauty is brewed all-year long and pretty widely available (at least in NYC). 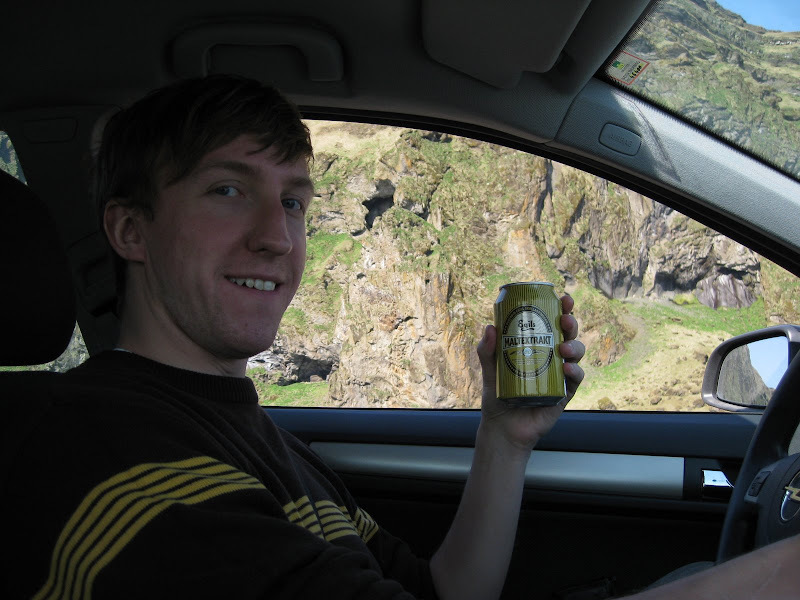 Craft Beer Exists in Iceland! I recently traveled to the land of fire and ice, which was easily the best thing I've ever done. The only negative I knew about going in was the fact that Icelanders LOVE their light lagers. Alright, no problem. I can enjoy a light lager every now and then. 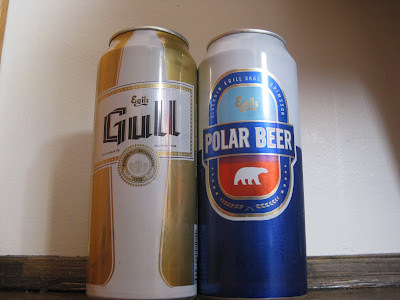 Here are two examples of the typical beer you'd find in a convenience store in Reykjavik: Gull (C- average on BeerAdvocate) and Polar Beer (which I can't seem to find on BA. I also had Maltextrakt which is just what you'd think it'd be: liquid malt extract. As in if you were to taste a stout before it was fermented, it would taste something like this. Very interesting. Very sweet. No alcohol. So anyway, before leaving I did some research on BeerAdvocate and discovered that there actually are a small number of craft beers in Iceland. They seemed to be few and far between, so I wasn't sure I would be able to track some down. The last night we were there we had some spare time and decided to walk around Reykjavik. We randomly picked Íslenski Barinn and they just happened to have the two main beers I was looking for from Ölvisholt Brugghús, Móri and Lava. 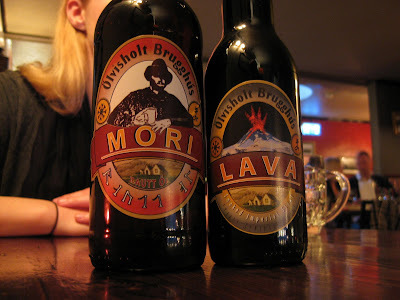 The Móri is a delicious Red Ale with American Amber influences and the Lava is a Smoked Imperial Stout. The Móri is great, but the Lava was top notch. Among the best beers I've had. I'm sure it was amplified by the fact that I was in Iceland and was also basking in my success of finding Icelandic craft beers, but wow. It's 9.4%, so it certainly warmed me up. Just the perfect balance of smoked flavors, coffee, chocolate and liquorice (and i usually hate liquorice). The following day before we left, we tried to find some Lava to take home with us, but unfortunately were told that it was only available at the Kringlan (mall) which would've been difficult to get to before leaving for the airport. I hope to some day make it back to Iceland, and based on how much an international beer trade would cost, I think I'll just have to wait. 2008 Sly Fox Christmas Ale...in May?? 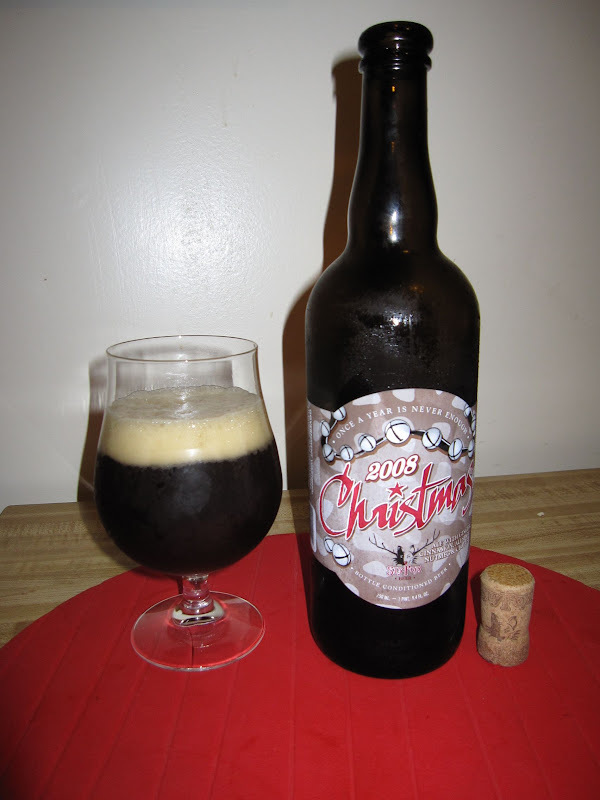 Yeah, so, back at the end of April I picked up a bottle of 2008 Sly Fox Christmas Ale that I discovered at a bodega in Greenpoint. You don't often find bottles like this at bodegas, so I figured I'd pick it up and either cellar it or drink it, and I debated it on the blog. Well, recently, I got thirsty and didn't have any other beers in the fridge (In fact all I have left are the few things I'm holding off on, like 3 12oz bottles of Founder's Kentucky Breakfast Stout) so I popped this open. It's definitely still good. It didn't seem that different at all from the last time I had it (um, Christmas), but I will say that it's a LITTLE strange to be drinking a spicy cinnamon beer in hot weather. Overall though, I don't think this is a great beer to cellar. Maybe that should have been obvious, but I always get an urge to cellar something that has the year slapped on the bottle. But I suppose that's not the best thing to go by. PSA: The next time you order a pint at your local craft beer bar, take a look at the bottom of the glass and make sure there's not too much space there. If they're giving you 14oz pours for 16oz prices, complaints should be made. Sidenote: Apologies for the lack of posts lately. I traveled to Iceland then got stuck in jury duty. We'll be back and running full-time again come tomorrow. Sorry to be so Dogfish Head heavy lately, but they're churning out great beers and exciting news along with fun videos. Check out these videos of the brew process for this summer's brew. I'm off to Iceland until Tuesday. Apparently there isn't much of a selection of good beer there, but I'm going to try to seek out some Ölvisholt Brugghús, specifically the Lava or Móri. 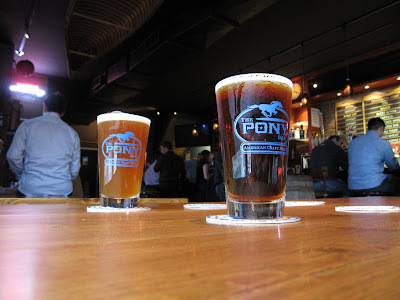 Last night we took a post-work excursion to a brand new craft beer bar named The Pony Bar. An oasis in the subway-less wasteland that is the Hell's Kitchen neighborhood of Manhattan. And WHAT an oasis! Every. single. beer. here. is. Five. Dollars. FIVE! DOLLARS! Granted, there are quite a few beers that are 8 oz. pours, but they seem to only be either the high ABV selections or the more rare kegs that they don't want to eliminate so quickly. While the selection was Sixpoint heavy on Monday evening (who's complaining?) because of the bus trip to Sixpoint/open bar they offered Sunday, they had a good range of other American micros as well. Great offerings from Chelsea Brewing Company, Avery and Ithaca among others. It was hard to believe we were sitting in midtown Manhattan drinking quality American craft beers for FIVE DOLLARS A PIECE! Highly recommended. 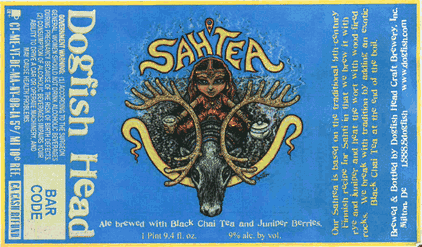 The label for the new Dogfish brew, Sah Tea has been revealed by BeerNews.org, and it looks good! Seems like it's only going to be available in 750ml bottles, and a strong 9% ABV. Back when we reviewed it in October 2008 (when it was only available at the Dogfish Rehoboth Brewpub), it was only 6%. Can't wait to try this one though. The New Yorker posted a great article about the conception of Sah Tea back in November that provides a great background. Dogfish Head Sah Tea should be available sometime this month. When I first tried this beer waaay back in 2007, I thought it was awful, terribly carbonated, sour and soda-like. I would have given it an F. And I loved Dogfish even then. But after two years of further beerducation, I've learned that it's actually the style, Berliner Weissebier, and a pretty darn good representation of it. Here's a video of owner/brewmaster of Dogfish, Sam Calagione explaining Festina Peche (which I actually thought was pronounced "Paysh" until you hear how Sam pronounces it in the video).